The Gaza Kitchen is a richly illustrated cookbook that explores the distinctive cuisine of the area known prior to 1948 as the Gaza District—and that of the many refugees who came to Gaza in 1948 and have been forced to stay there ever since. 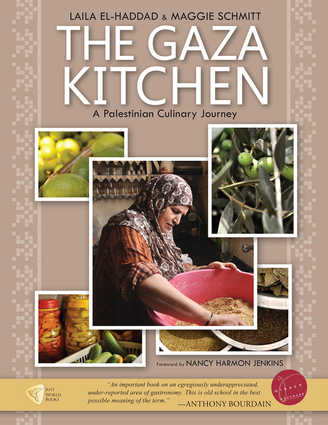 In summer 2010, Laila El-Haddad and Maggie Schmitt traveled throughout the Gaza Strip to collect the recipes and shoot the stunning photographs presented in the book.The Gaza Kitchen's 130 recipes codify this little-known part of the Middle Eastern culinary canon for the first time ever-- in any language. But this is not just a cookbook. In its pages, women and men from Gaza tell their stories as they relate to cooking, farming, and the food economy: personal stories, family stories, and descriptions of the broader social and economic system in which they live.Former Senior Food Writer for the New York Times Nancy Harmon Jenkins introduces the book, and Gaza's cuisine, in her very well-informed Foreword. Laila El-Haddad is co-editor of Gaza Unsilenced (2015), co-author of The Gaza Kitchen: A Palestinian Culinary Journey (2013), and the author of Gaza Mom (2010). She is a talented writer, analyst, and social activist, and a policy advisor for Al-Shabaka, the Palestinian Policy Network.Born in Gaza, El-Haddad currently lives in Columbia, Maryland. Her co-author on The Gaza Kitchen, Maggie Schmitt, is a writer, researcher, translator, educator, and social activist. She holds a B.A. from Harvard in Literature and has conducted advanced graduate studies at the Universidad Autónoma de Madrid. Schmitt, who lives near Madrid, works in various media to explore the daily practices of ordinary people living in the Mediterranean region.